These little gift books can be completed in less than an hour once you get the technique down. You can even create custom papers for the covers by printing logos from your favorite school, holiday clip art, birthday rubber stamps, graduation stickers, and more. The step-by-step photographs in this article will walk you through the process of making these darling scrapbooks that make great gifts. Your family and friends are sure to love them. This mini scrapbook opens to reveal page after page of folded accordion-style pages that have room for journaling, photos, memorabilia, and embellishments. The center of the album has spaces for 4x4 inch square photos which are surrounded by smaller, triangular shaped spaces perfect for journaling. 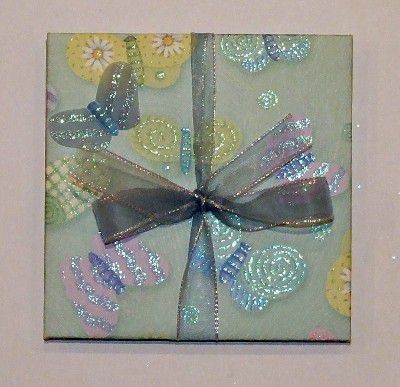 The completed book measures 4 1/2 x 4 1/2 inches and is tied closed with a ribbon making it a perfect brag book or gift mini scrapbook. To get started, cut two 4 1/2-inch pieces of chipboard, two 5 1/2-inch pieces of paper for the covers of the book, three pieces of 8-inch square cardstock for the pages, and a 16-inch piece of ribbon. If you want a book with more inside pages, add them in odd numbers, i.e. cut five 8-inch squares of cardstock instead of three. Cover the chipboard pieces with the two sheets that you selected and cut for the front and back of the mini album. Adhere each piece of chipboard to the center of the back of each cover sheet, trim the corners of the papers and then wrap the edges around the chipboard. Use photo tape, extra tacky tape, or book glue to hold the paper to the chipboard. Also use a piece of photo tape to attach the center of the piece of ribbon to the middle of the back of the piece of chipboard that will be the back cover of the book, as shown here. Score three lines on each of the 8-inch cardstock squares. Each paper is folded in half both directions and then also folded one time on the diagonal (just one diagonal direction), as shown in these lines. Fold each of the 8-inch squares on the three score lines and then open them up again. Crease these folds really well, you may want to use a bone folder since this will prepare you for the next step. Fold each square into a smaller square by creating "mountain folds" along the diagonal score lines. Bring these fold together toward the center of the square. See the photo for guidance. Repeat the last step with all three 8-inch squares. Press them down and again crease very well. You will have three folded squares that look like the photo shown here. Open up the folded inside pages and turn one over lining them up as shown in this photo. Line up the small squares on each piece overlapping it with a square on the next piece. Attach these squares together with photo tape to hold the pages securing in place. This will create the accordion inside pages component of the album. Use photo tape to secure the folded pages to the inside of the book covers, being sure to center the pages on the inside of the book covers. The pages should completely cover the chipboard that is still showing on the back of each cover piece. The ribbon will now be sandwiched between the back cover and the inside pages. You can wrap the ribbon around the finished book and tie a bow. The finished book is now ready for you to embellish the inside pages with photos, journaling, stickers, rubber stamping, etc. With three inside pages sheets as shown here, you will have room for six 4x4 inch photos and many, many triangular photos or journaling boxes. Remember to embellish both the front and back of the inside pages.